Pallet Renew specializes in providing a full range of innovative, practical, and environmentally sound pallet services functional for clients in any industry worldwide. Pallet Renew holds a Board Member seat within the industry associations, including the Canadian Wooden Pallet & Container Association (CWPCA) in addition to membership with National Wooden Pallet & Container Association (NWPCA). Pallet Renew Inc. is in an approved participant in the Canadian Wood Products Certification Program (CWPCP) for export with the Canadian Food Inspection Agency (CFIA). Pallet Renew is located near Pearson Airport in Mississauga, with access to all major highways, including the 401, 410, 427, 407 and the QE. Pallet Renew was incorporated in 1989 and began establishing itself as a new and dynamic face in the industry. 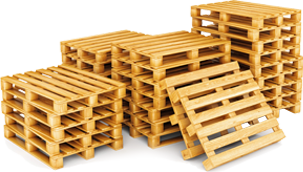 Our goal was to revitalize some of the ideas surrounding pallets and how they were utilized or rather under- utilized in the logistics pipeline. We started by becoming stewards to our environment offer various industries a chance to use fully recycled pallets. As demand increased and business grew, Pallet Renew implemented automated equipment to increase both production and quality of product. Conveyors, repair stations, nailing and barcoding equipment provided the new foundations Pallet Renew required to succeed in meeting those goals. We continue to challenge ourselves to increase the efficiency of our operations, through the many technologies that encompass business today. The connections that are made. The loyalty that is created when all of these elements come together.